Police are appealing for information after three masked men broke into a house in Padiham and assaulted a teenager. Police were called around 8-20pm on Friday after reports of three men wearing masks had broken into a property in Russell Terrace. The men, carrying a small axe and a metal baseball bat, stole two iPhones from two teenage girls and punched a 17-year-old boy before demanding drugs. A man and woman, both upstairs in the address at the time of the incident, confronted the men who made off from the scene with the mobile phones and some cash. The men are described as wearing dark clothing and balaclavas. Detectives are appealing for information following the incident. Det Con Lianne Fielden, of Lancashire Police, said: “This was a shocking incident which has left the victims terrified and upset. 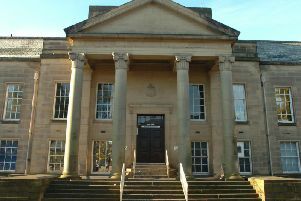 “Three men raided a property in Padiham demanding drugs before making off from the scene. “This is clearly a distressing incident for all involved and we are carrying out a number of lines of inquiry to find those responsible. “Did you see anyone acting suspiciously or behaving unusually in the area around the time of the offence? Did you see the men described? Anyone with information can contact police on 101 quoting log reference 1328 of January 18th.